September 8, 2015 - REVA Air Ambulance company's worldwide jet fleet is grounded today in observance of one of its youngest captains’ funeral, which comes in the wake of his tragic, headline news-making car crash on South Florida’s Interstate 95. During the past four years, Captain Patrick Gustin piloted medical evacuation flights between six continents, shuttling injured and ill Americans abroad to U.S. hospitals; airlifting premature babies to critical care units and flying people of all ages, with various conditions, for urgent treatments. Just a few miles from the company’s headquarters at Fort Lauderdale Executive Airport, FL, the 35 year-old pilot was driving his 1999 Porsche 911, when, “for an undetermined reason, the vehicle veered to the right and left the roadway onto the grass shoulder and struck a palm tree,” according to the Florida Highway Patrol. Gustin died of sudden impact injuries. He was wearing his seatbelt. No other vehicles were involved in the 3:15 AM early morning crash, last Thursday. The cause of the crash remains under investigation, according to FHP. 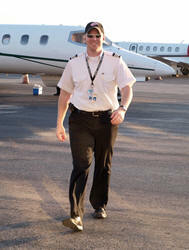 Captain Gustin graduated Embry-Riddle in 2005 with a B.S. in Aeronautical Sciences. He has held several pilot positions since then. Gustin joined REVA Air Ambulance in 2011. Pilot: “Ft. Lauderdale Tower, Medevac 111 Whiskey Bravo requests change in IFR Flight Plan ?" REVA Air Ambulance - Flyover Salute - The company says it is organizing a jet aircraft flyover salute for some time after the funeral. The company anticipates resuming normal flight operations on Wednesday.